This photo of Sunnyside Beach was taken in July of 2011. Viewing the site today, it is difficult to imagine that from the 1922 until the 1950s, this was Toronto’s most popular bathing area and the site of the city’s main amusement park. From the May 24th-weekend until Labour Day, crowds descended on Sunnyside to stroll along the boardwalk, splash in the lake, enjoy the amusement rides, and consume the fat-laden treats at the food stands. It was a magical world. After Sunnyside was demolished, nothing was ever built to equal it. Sunnyside possessed a long history that preceded its days an an amusement centre. In centuries past, along the shoreline where Sunnyside was later built, Indians gathered to trade furs with the French. In 1813, when the Americans invaded Upper Canada, during the War of 1812, their fleet came ashore at Sunnyside, and then proceeded eastward to attack Fort York, where the British garrison for the town of York was located. During the early decades of the 20th century, as the city expanded westward, Sunnyside became a popular area for bathing. The newly paved and widened Lakeshore Boulevard, gazing west, early in the morning on August 3, 1922. This photo was taken the year Sunnyside opened to the public. In the background is the new Bathing Pavilion, which commenced its life the same year the photo was taken. This building remains on the site today. The south facade of the Bathing Pavilion in 2014, facing the sandy beach and waters of the lake. The north side of the Bathing Pavilion at Sunnyside, beside the boardwalk. Strollers on the boardwalk in 1922. This was the only photo of the Palais Royale I was able to locate in the City of Toronto Archives. It was taken on the occasion of the ninth annual convention of the International Association of Street Sanitation Officials, in October of 1928. Palais Royale in the 1930s (photo from the internet). The basement level that once housed Walter Dean’s Boat Factory can be seen. Palais Royale in 2014. An addition can be seen at the rear of the building. In this modern photo, the east-bound lanes of the Lakeshore Boulevard can seen on the left-hand corner of the picture, and the west-bound lanes on the far right. The land in between the lanes is the parking lot of the Palais Royale. In the 1920s, the amusement rides and food stands of Sunnyside were located on the site of the parking lot. The modern St. Joseph’s Hospital is in the extreme upper-right corner of the photo. Gazing east along the south side of Queen Street, where it intersects with King and Roncesvalles. The Sunnyside Railway station can be seen in the distance. This photo was taken in 1922, the year that Sunnyside officially opened. Many people arrived on the Queen streetcars, and walked from this intersection, over the bridge, and down the stairs to Sunnyside. A photo taken 30 August 1923, looking northeast to the bridge near Queen/King and Roncesvalles. The bridge crosses over the railway tracks that separated Sunnyside from the streets above the embankment. View from under the bridge on 30 August 1923. This is the same bridge as the previous photo. Behind the bridge can be seen the Sunnyside rollercoaster. The Palace Pier under construction in July of 1931. It was beside the lake, on the east bank of the Humber River. The pier extended out into the lake and was an important attraction at Sunnyside for several decades. It has since been demolished and Palace Pier Condominium is on the site. This photo was taken in October of 1931. The Palace Pier is nearing completion and can be seen on the left of the picture. The new bridge over the Humber River, being built to accommodate the Lakeshore Boulevard, is also visible, as well as the old iron bridge. The flat-roofed building beside the new bridge, on its north side, is Jeckle’s Boat House. The beach and the schooner the Julia B. Merrell, in August of 1931. During the late 1920s and 1930s, old sailing vessels were often burnt in the evenings after dark. It was an attempt to attract crowds to Sunnyside. The burning of the S.S. John Hanlan at Sunnyside on July 19, 1929. View of the Sunnyside Swimming Pool in the 1940s, looking east. The Bathing Pavilion is to the west of the pool, and not visible in this picture. 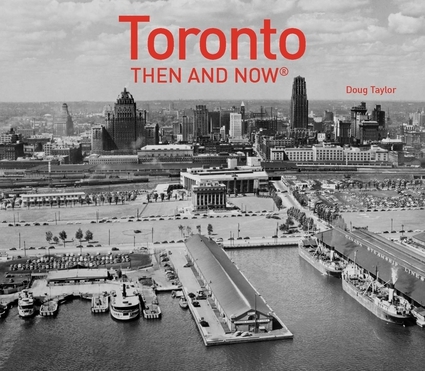 I am grateful to the City of Toronto Archives for the photos employed in this post.